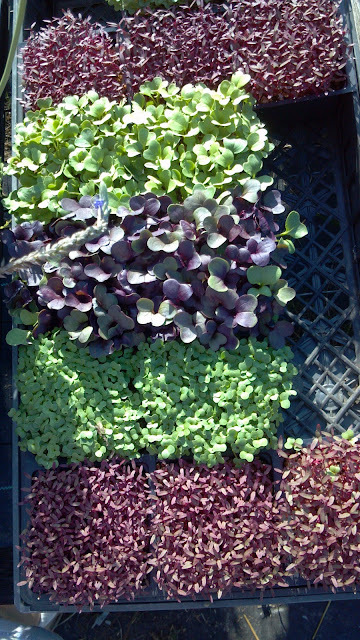 Microgreens! Vegetables In 7 Days! Ready on day 5. Sold some @ FM. The vegetable du jour. Foodie craze. High-end garnish. 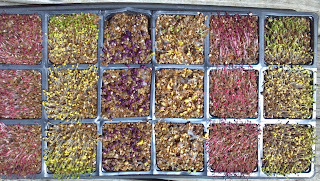 Very flavorful and easy to grow nutrition: Microgreens. A few years ago, 1997 to be exact, Johns Hopkins researchers found that 3-4 day old broccoli sprouts are very nutritious. How about that? People who labeled sprouts as hippy food began to eat them. Things get fuzzy after that. 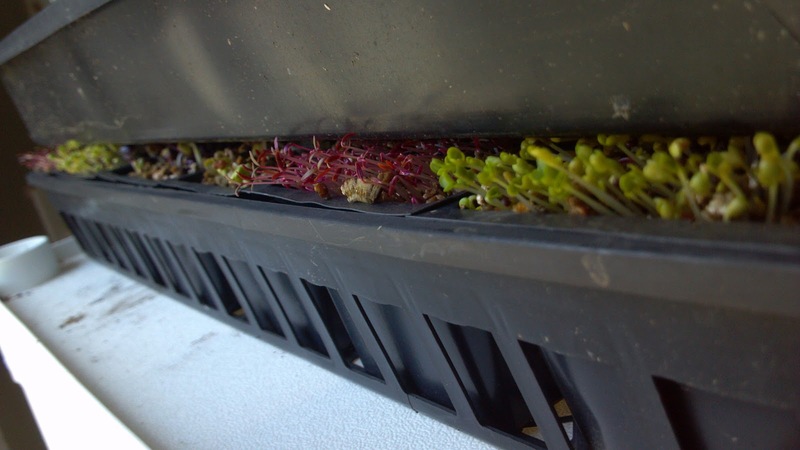 We'll skip the lengthy history of dirt and whittle it down to this: Both camps agree sprouts are tasty and nutritious! 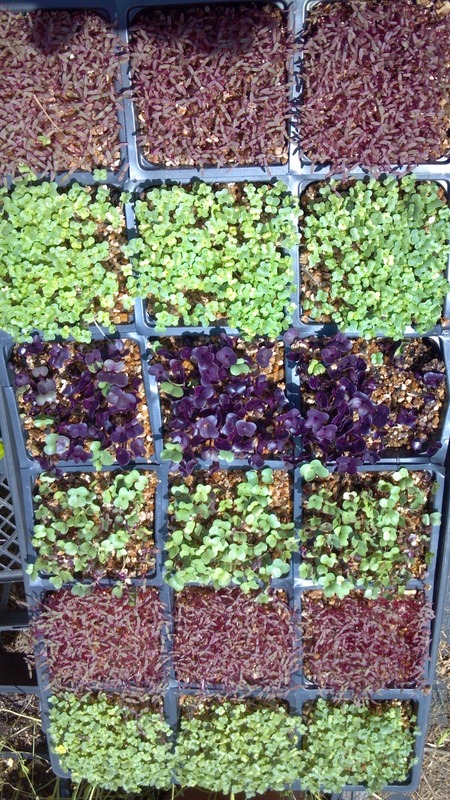 In comes a new trend: Microgreens. Eating sprouts without their roots. Let's face it, the roots were always kinda hairy and hard to eat anyway. Turns out they are also a natural host for germs and the center of the sprout-eating controversy. Be gone roots! The older the sprouts get, the more special nutritious chemicals they lose. But not much. Even full-grown vegetables have been known to be, dare I say it: nutritious. 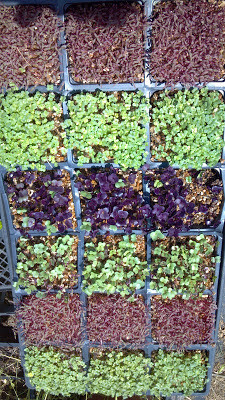 Microgreens are sprouts, a few days older than the stringy ones, grown in soil and sunshine so they have vibrant colors and sturdy textures. Then they are cut and eaten in the seedling stage. They won't grow again - just like other types of sprouts. They grow in just a few days and can be grown almost anywhere. Like wheatgrass, they are a great windowsill crop. The health benefits of growing plants, fresh vegetables, meeting a goal successfully are all stirred together with immediate gratification. First: Fill a container with soil. Mix in a little fertilizer so they will still be green and usable a few days after you forget about them. Second: Sprinkle a loose layer of seeds over the soil. I like radish and tatsoi best, but almost any lettuce or root crop will work. 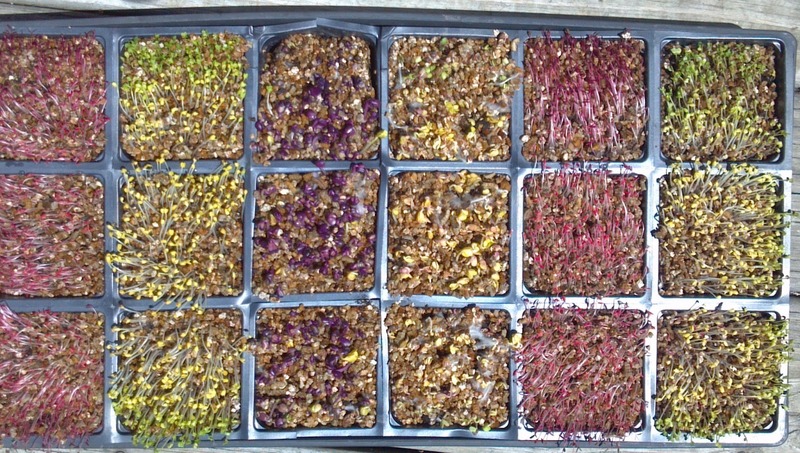 Most seed catalogs have a section dedicated to microgreens. Get those or just choose from there and then hit the seed store. Third (or fourth): Tamp them - that means to pat them down gently so they make good contact with the soil but don't compact the soil. Fourth (or third): Cover the seeds with a thin layer of something. I use vermiculite. You can use sand. Soil will take a day or two longer. I read of one grower that uses paper towel. Last: Water them and put them someplace warm. At this point I cover them additionally with something solid like a cookie sheet or plastic wrap, but that's not necessary. 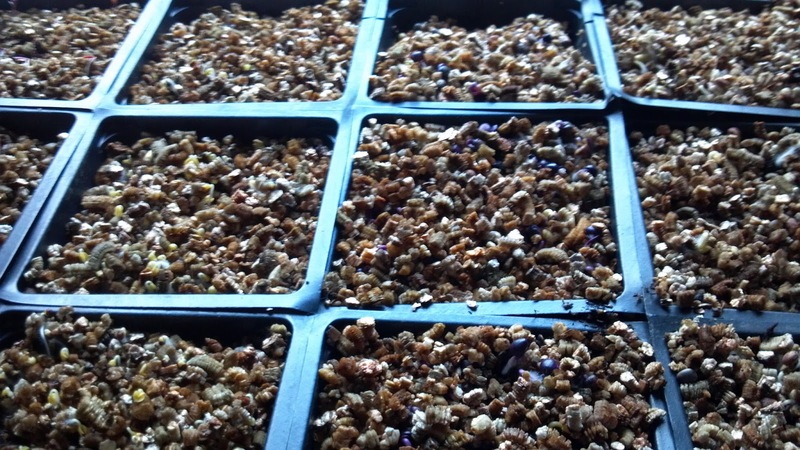 It just makes germination a little more consistent. 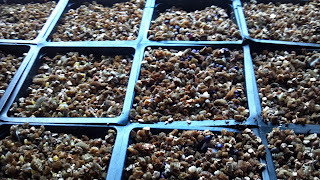 They are going to germinate in a day or two. Three if you skip the cookie sheet. Four if you covered with soil. A week if they are cold. Put them in as much sun as you have. They should be ready to cut in a week-10 days. Think of them like sprouts. They won't grow back. My mother thinks it is extremely important to suggest you cut them into a salad spinner and spin them in the wash water. She was stunned when she saw me use this method. It does save tons of time washing them. I know there are a lot of questions about this and I'm happy to answer them! Just leave them in the comments below. Thanks for finding me, plant junkies! And wanna-bees! Great to see your page views! I'd love to see your microgreens!